We will be touring the megaliths and stone structures of beautiful Sardinia for a total of 5 full days. 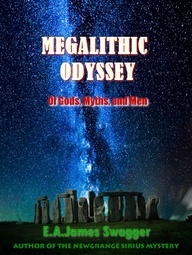 featuring an amazing variety of architecture, construction methods, and ritual purpose. In the afterlife, an entire population observes Sardinia and smiles. This population is the Nuragic population which observes people who try to interpret the Tombs of the Giants, the Nuragic Wells, the holy sources and the Nuraghi. The Nuragic civilization developed between the Bronze Age and the Iron Age (from 1800 to 500 B.C.). 8000 nuraghes, about 400 tombs of Giants and no specified number of sacred wells are examples of the impressiveness of the nuragic civilization. The so-called bronzetti (representing little modern ships) and the archaeological finds (such as the representations of Shardana people in the Egyptian temple of Medinet Abu) demonstrate how the Nuraghic people dominated the whole Mediterranean area. The theories of Sergio Frau, a journalist and writer of the book “Le Colonne d’Ercole, un’inchiesta” (The Pillars of Hercules. 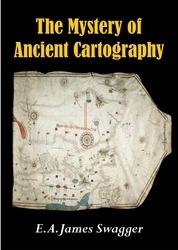 An investigation) state that Sardinia actually was the powerful Island of Atlas (also called Atlantis). Eminent scholars and archaeologists of all over the world maintain these theories. Interested in a Mediterranean Adventure of a Lifetime? The first 5 bookings will receive the early-bird discounted rate. A formal receipt from Modern Knowledge and an introductory email will be sent to you shortly after making your deposit payment. 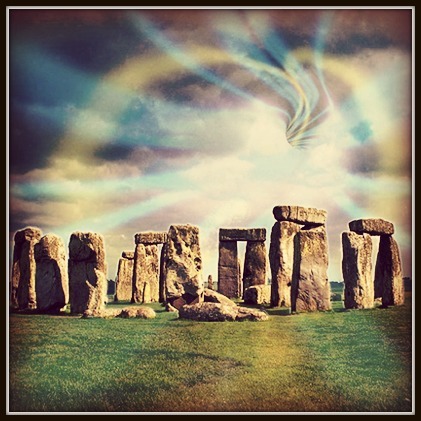 Stonehenge is a massive stone monument located on a chalky plain north of the modern-day city of Salisbury, England. Research shows that the site has continuously evolved over a period of about 10,000 years. The structure that we call “Stonehenge” was built between roughly 5,000 and 4,000 years ago and that forms just one part of alarger, and highly complex, sacred landscape. The biggest of Stonehenge’s stones, known as sarsens, are up to 30 feet (9 meters) tall and weigh 25 tons (22.6 metric tons) on average. It is widely believed that they were brought from Marlborough Downs, a distance of 20 miles (32 kilometers) to the north. Smaller stones, referred to as “bluestones” (they have a bluish tinge when wet or freshly broken), weigh up to 4 tons and come from several different sites in western Wales, having been transported as far as 140 miles (225 km). It’s unknown how people in antiquity moved them that far. Scientists have raised the possibility that during the last ice age glaciers carried these bluestones closer to the Stonehenge area and the monument’s makers didn’t have to move them all the way from Wales. 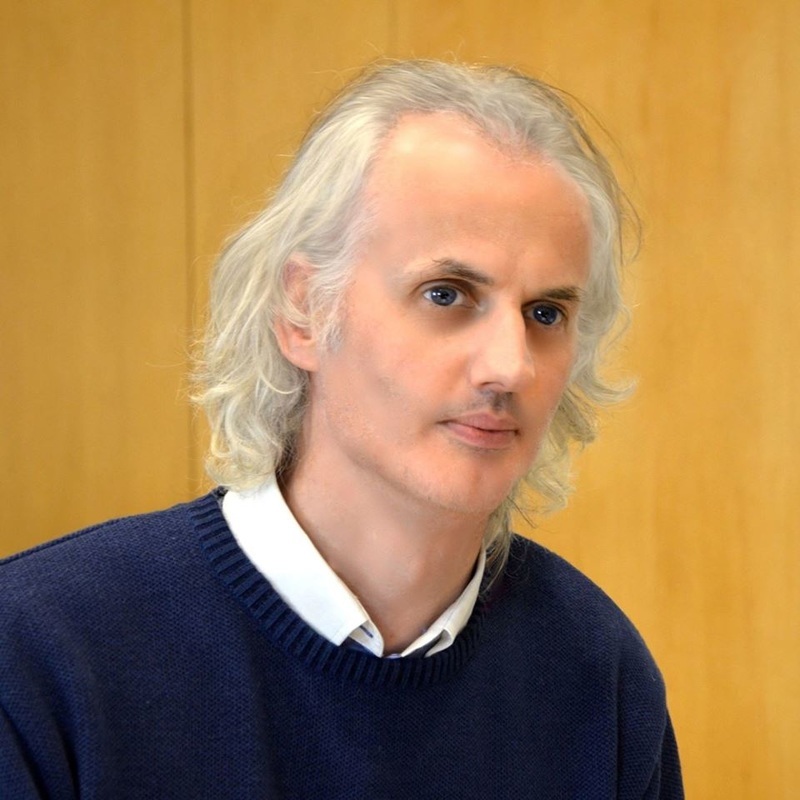 Water transport through raft is another idea that has been proposed but researchers now question whether this method was viable. Avebury - Contained within a giant circular henge about 430 metres across, the site of Avebury rivals, and some would say surpasses Stonehenge for its sheer scale and impressiveness. 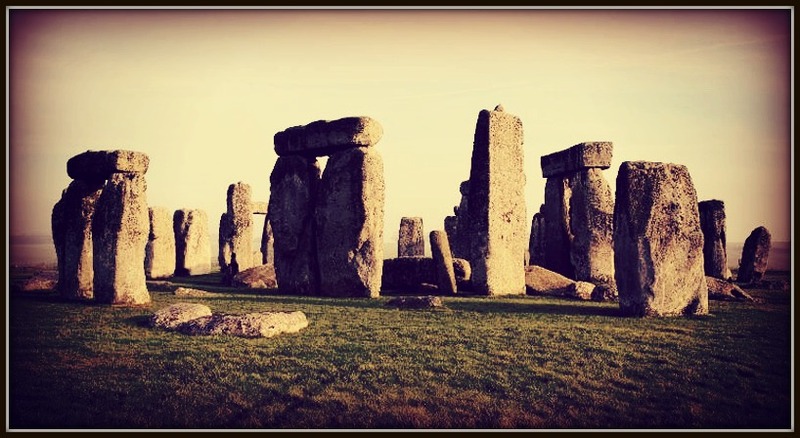 The antiquarian John Aubrey certainly agreed and wrote in the mid 17th century - "it does as much exceed in greatness the so renowned Stonehenge as a cathedral doeth a parish church". 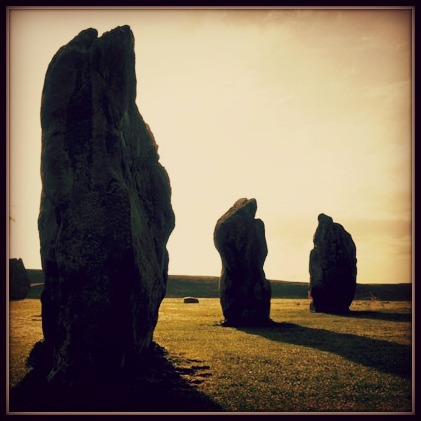 Avebury is certainly calmer and more accessible than Stonehenge as although the A361 road passes through the middle of village the whole area can be easily viewed on foot and the visitor is free to wander amongst the stones. Constructed during the Neolithic, probably around 2500BC, the banks of the henge earthwork that surrounds the whole site are around 5 metres high - originally they would have been nearly 7 metres tall, between 20-30 metres thick at the base and enclosed an area of some 30 acres (12ha). Within them an internal flat bottomed ditch that would once have been up to 9 metres deep and over 20 metres wide was cut into the underlying chalk and an estimated 200000 tons of chalk rubble hauled up to construct the bank with the central area of the henge accessible by four entrance causeways which are now used by the road and village street. Today this mammoth construction is carpeted in a layer of grass but when built the white of the chalk would have stood out in dramatic contrast to the green of the Marlborough landscape. October is a fairly cool time to visit London, UK, when the autumn season is well underway. During this month, the average temperature is 12°C – that’s 4°C cooler than in September – which slowly changes as the month develops. On October 1st, daily highs start off at 18°C, gradually dropping down to 13°C by October 31st, rarely going over 21°C or falling under 11°C. The daily low temperatures follow a similar pattern, beginning at 12°C on October 1st and steadily falling to 9°C on October 31st, rarely exceeding 15°C or going under 5°C. 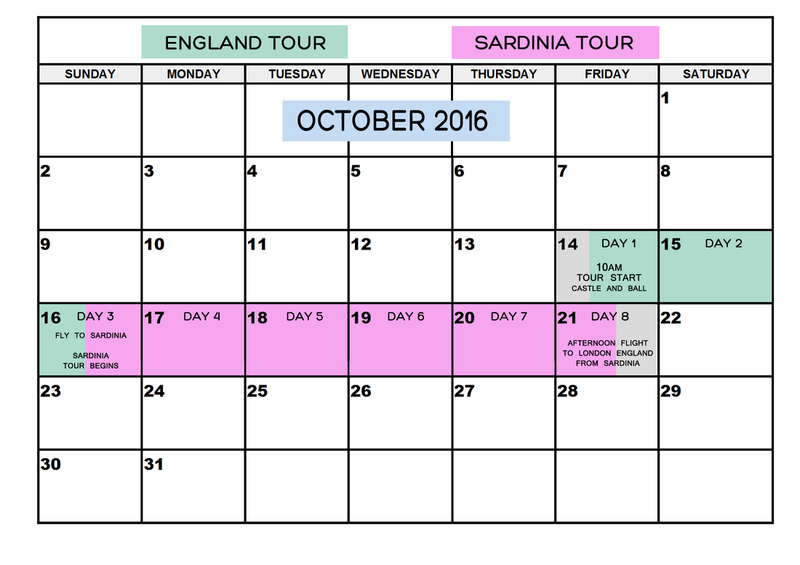 ​on this 2016 October Tour of Sardinia! ​Google Earth Tour file and FULL Itinerary (available soon) to see a complete listing of the tour objectives and destinations. Su Nuraxi is a nuragic archaeological site in Barumini, Sardinia, Italy. 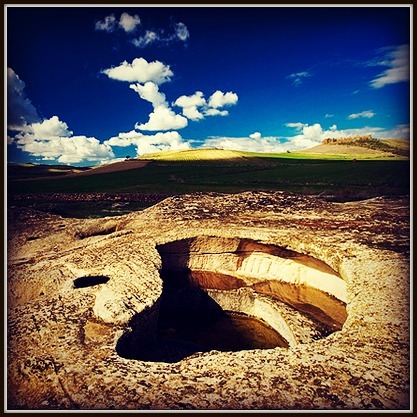 It was included in the UNESCO list of World Heritage Sites in 1997 asSu Nuraxi di Barumini. 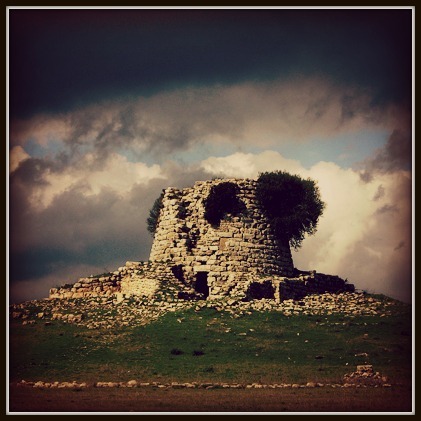 Su Nuraxi simply means "The Nuraghe" in Campidanese, the southern variant of the Sardinian language. 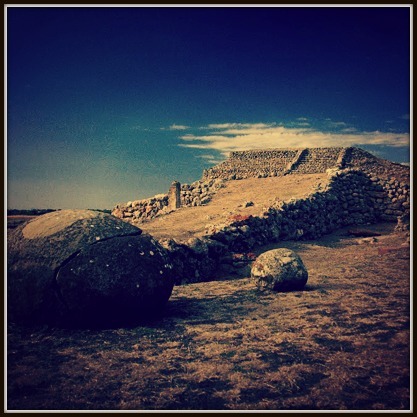 Su Nuraxi is a settlement consisting of a seventeenth century BCE Nuraghe, a bastion of four corner towers plus a central one, and a village inhabited from the thirteenth to the sixth century BCE, developed around the Nuraghe. They are considered by scholars the most impressive expression of the Nuragic civilization and were included in the UNESCO list of World Heritage Sites in 1997. The oldest part of the Nuraghe consists of a central tower with three superposed chambers (18.6m high), was built in blocks of basalt between the seventeenth and thirteenth centuries BCE. Later, during the Late Bronze Age, four towers joined by a curtain wall with an upper balcony (no longer extant) were built around the central tower, all communicating with an inner courtyard served by a well. During the Iron Age, the complex was surrounded by a heptalobate curtain wall. The real function of the nuraghe is still debated. 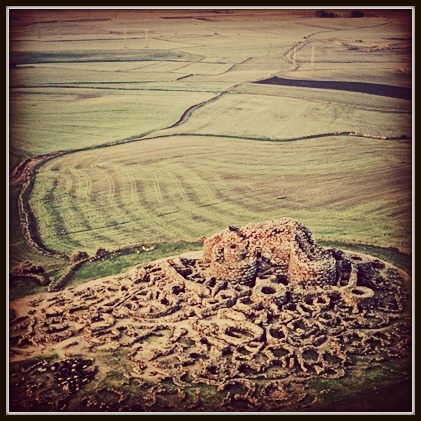 The discoverer of Su Nuraxi, the archaeologist Giovanni Lilliu, confirmed the traditional interpretation of fortress-site. Other archaeologists believe that the oldest part of the dolmen was destined for a religious purpose, refuge, civil or even parliament or registered the village chief, while the towers were added perhaps intended for military purposes and stock. A village, intended to accommodate the surrounding population, was built around the Nuraghe in the Late Bronze Age. During the sixth century BCE, the buildings were destroyed and subsequently restored by Carthage before being occupied by the Romans. They were eventually completely abandoned. ​The necropolis of Tuvixeddu is a punic necropolis, one of the largest in the Mediterranean, located in a hill inside the city of Cagliari,Sardinia, called Tuvixeddu (in sardinian language Tuvixeddu mean hill of the little holes). Between the 6th and 3rd centuries BC the Carthaginians chose this hill to bury their dead: these burials were reached through a well dug into the limestone rock (from two to eleven meters deep), a small opening introduced to the burial chamber. The burial chambers were beautifully decorated; there were found amphorae and ampoules for the essences. 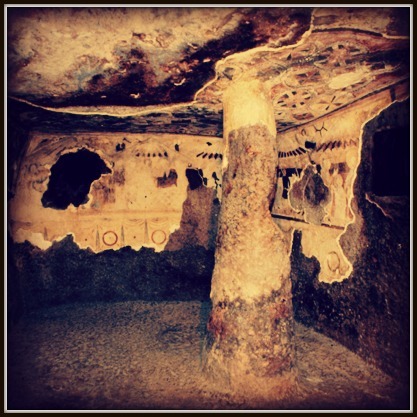 Of particular interest among the Punic tombs, the "Uraeus tomb" and the "Fighter Tomb", decorated with paintings of palm trees and masks, still well preserved. Another famous tomb is that "of the Wheel". On the slopes of the Tuvixeddu hill there is an Roman necropolis, which overlooked the road at the exit of the city. The Roman necropolis consists mainly of arcosolium tombs and columbaria. The necropolis opened to the public in may 2014, during the XVIII edition of "Monumenti Aperti". The archaeological area is large, it originally consisted of an area of about 80 hectares (200 acres). 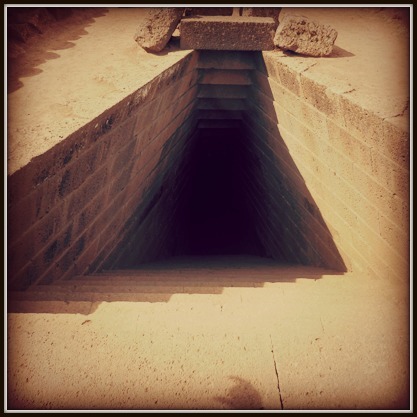 If you want to disclose the mystery of the Sacred Wells you cannot miss the nuragic source “Su Tempiesu”. Fortunately, this site has been perfectly preserved. Most of nuragic wells in the Island have only the well’s structure and the stairs, whereas “Su Tempiesu”, probably due to a landslide that protected it till 1953, keeps its original structure. This beautiful well shows that the nuragic sources were really solid buildings. They were fascinating and cosy temples and probably only priest had access to them. The stones used for the nuragic wells are set with more accuracy than the ones used for the nuraghi. Furthermore stone working is more regular and accurate. You can find this kind of building all over the Island, inPaulilatino, Bonorva or Olbia for instance. The holy source “Su Tempiesu” is the only one with a double roof due to the shale wall covering it. This temple was probably built at the end of the Bronze Age and it was used till the early Iron Age. The fore part of the holy source, tre metres and half high, is formed by a triangular element ending with a pyramidal block. The holy source Su Tempiesu is composed by trachyte and basalt stones connected to lead cramps. The stones used to build this monument may have been carried from far away because in the area around the temple there are only schist and granite outcrops. Many blocks have some particular juts (rustications) with a knoll shape. Their aim was probably to facilitate the transportation of the stones. But some reliable scientists, such as Lilliu and Taramelli, consider it nuragic symbols. According to this interpretation the knolls could represent the Mother Cult giver of water, life and nourishment. Su Tempiesu follows the classical nuragic well’s pattern, there is vestibule, a staircase (4 steps in this case) and a cell (with a “tholos”roof) to keep the source water. Also in this case the ground is made with trachyte blocks with a little round hollow used to purify the water. During the high-water, water spilling over the well flows off through an ingenious canal. In the first step there is a little gutter going on to a second source placed in the lower part of the monument. The archaeological finds have been found in this source during the excavations (they are today at the National Archaeological Museum of Nuoro). Pranu Muttedu Park, represents one of the most impressive archaeological sites in Sardinia. The Park area is divided into two parts, for a total extension of about 200 thousand square meters, is affected by one of the most important monumental complexes of Sardinian prehistory. Excavations carried out at the beginning of the years ' 80, have unearthed many artifacts of different type and invoice, referring to permanent "culture communities" Ozieri "" dating back to the Neolithic (3200-2800 BC). The presence of numerous tombs and menhirs suggests a site usage for burial rites and religious, connected to the cult of the ancestors. The archaeological complex Has the highest concentration of menhirs in Sardinia known (about sixty, variously distributed in pairs, alignments or groups). The archaeological complex of Pranu Muttedu is one of the most important funerary areas of Sardinia prenuragic and is located near Goni , a small village in the province of Cagliari . The complex has the highest concentration ofmenhirs and megaliths that is known in Sardinia (about sixty, variously distributed in pairs, groups or arrays). The area is also a Necropolis in Domus de Janas with three tomb circles. 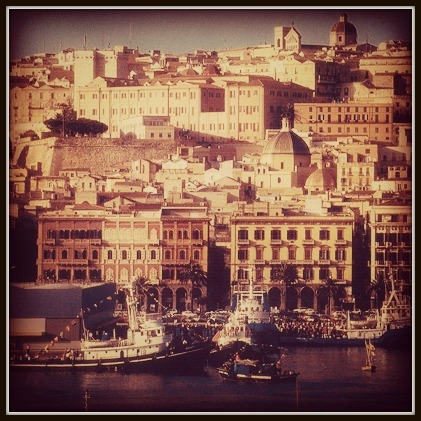 The complex has been excavated by Enrico Atzeni, on several occasions since 1980. The necropolis of Montessu is located just a stone’s throw from the small village of Villaperuccio along the provincial road leading to Narcao. 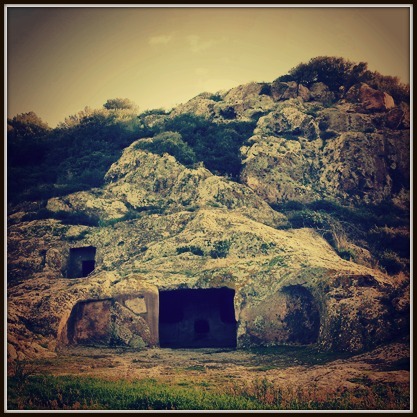 It is one of the most important burial sites in Sardinia from the Prenuraghic Era. This was the place in the Late Stone Age where peoples coming from the Middle East during the 3rd millenium B.C. decided to build a city for their dead. The volcanic rock hillsides of Sa Pranedda, a hollow valley forming a natural amphitheatre, provided the ideal setting for these underground places of eternal rest consisting of about forty small dug-out grottoes, which in local dialect are known as domus de janas meaning fairy houses or witches’ houses. These were the same people who brought the so-called San Michele or Ozieri culture to the island. The most interesting examples are the sanctuary-tombs known as sa cresiedda and sa grutta de is procus (the “little church” and the “cave of pigs”). These imposing tombs feature entrances about two metres high and have wide, open areas carved into the rock, closed in by rows of large stones placed in a kind of semicircle, outlining the sacred areas which may have been used for excarnation of the deceased and for accommodating friends and relations who came to pay their last respects. ​A ziggurat on the Mediterranean island of Sardinia? As strange as it may sound, this is precisely the conclusion – or suggestion – that archaeologists have reached. For the structure of Monte d’Accoddi is not only something that is set apart from anything else found in Sardinia, it is unique in the entire Mediterranean region. As such, Monte d’Accoddi is an oop-construction, on par with the oop-arts – out of place artefacts – that have generated great interest, and controversy. Situated between the coastal town of Porte Torres and the city of Sassari, the site of Monte d’Accoddi in the northwest part of the largest island of the Mediterranean, is sometimes not even indexed on maps. As such, it doesn’t attract many visitors, despite a very impressive car park, suggesting that when the site was finally fully excavated and opened for tourists, two decades ago, the mass influx of tourists that was expected, never came. Monte d’Accoddi is a pyramid. It is the only pyramid known on Sardinia. It is a large platform pyramid. With a causeway, which is why it is more commonly referred to as a ziggurat. But it also has a menhir (a standing stone). And a dolmen. And a stone sphere. Which makes it even more unique, not just on the island, but the entire Mediterranean Sea, in fact – as too few people have pointed out – in the entire world. For there is no other site in the world that has all of these items all in one place. And that’s what makes Monte d’Accoddi an oop-construction, as it has a bit of everything, but brought together in a manner that no-one else has done as such. ​Monte d’Accoddi for some means Monte de Code, “stone mountain”, and for others “mountain with tail”. Whichever one is the correct translation, both are correct in their labelling, as that’s precisely what the construction is: a stone platform pyramid with a ramp. The main structure itself resembles, in appearance, the ziggurats of Mesopotamia. A ziggurat is defined as a “temple tower, either stepped in tiers or spiral, symbolizing the mountain peak where the gods dwelt and where the skies met with the earth.” Ziggurats are thought to represent a cosmic axis, a bridge between heaven and earth and unlike the pyramids of Ancient Egypt, they had a temple on top – like most Mexican pyramids. It is therefore interesting that Monte d’Accoddi shares more with the ziggurats of Mesopotamia than with Egypt, which is closer and easier to reach (by sea) from Sardinia. The mound measures almost 36 by 29 meters, is nine metres high, tapers inwards, with a long – 42 metres – ramp ascending one side to a flat top. 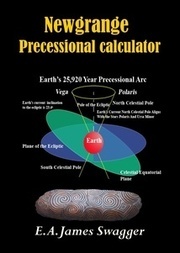 It is orientated north-south, thus conforming to the general rule that pyramids are aligned to the cardinal points. Along the ramp, today, a stone sphere is posed on the right hand side where the ascent begins; along the way, to the left, rises an impressive, 4.7 metres tall standing stone (5.75 tonnes heavy), while to the right, is the “altar” stone of a dolmen, measuring 3.15 by 3.20 metres, weighing 8.2 tonnes. Both standing stone and dolmen are typical of the megalithic remains one can find in so many other locations all over Europe – and beyond – as well as elsewhere on Sardinia. 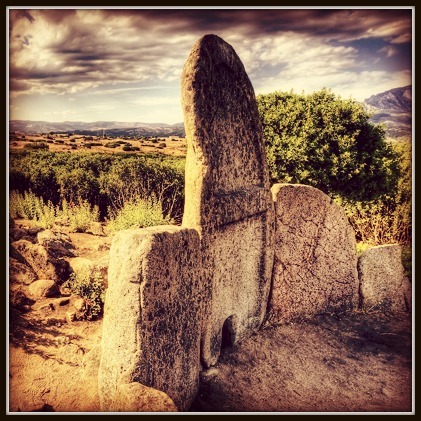 The only differentiator is that these stones are somewhat bigger than your average standing stone or dolmen – the standing stone is in fact the second biggest in Sardinia, after the one of Villa Sant’Antonio (Arborea). The dolmen differs from many other dolmen because its top surface has a number of cupola – circular indentations – which along the sides are clearly manmade, and enhanced to become little “run-off tunnels”, which run from the top to the side of the stone. Why a standing stone and a dolmen would stand on either side of the ramp is impossible to explain, as it is unique to this site. The closest parallel to a standing stone one might find elsewhere in this position, is with the obelisks that often stood at both sides of an entrance into an Egyptian temple. The causeway itself leads to one of the platform levels of the pyramid; to reach the upper level of the pyramid, a series of steps needs to be climbed, which are offset from the centre, and which give access to the flat surface. At one point, this housed a wooden construction, a veritable temple. Archaeologists speculate that right below, at ground level, is a “cave”, on top of which the entire construction was built. Though the cave is likely to have been man-made, construction-wise, it echoes the reasoning behind the Great Pyramid, which was constructed on top of a natural cave. However, the cave’s existence remains somewhat speculative. 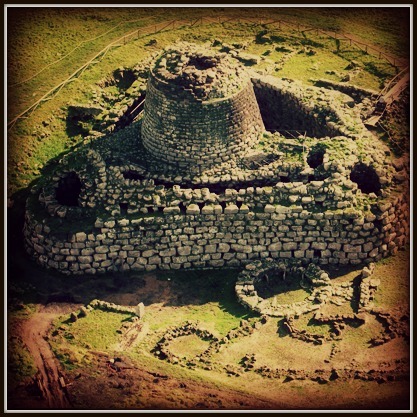 The nuraghe Serbissi is nuragic complex dating back to XVIII-X century BC. It is located in the municipality of Osini in Ogliastra. The site is located on a limestone plateau between the towns of Osini and Gairo. The nuragic complex, built over a cave with two entrances, consists of a central tower of 6.3m high flanked by three smaller towers, around which are placed 8 circular huts. Access to the towers is through a small courtyard. The complex was used from the Early Bronze Age to the Late Bronze Age. The archaeological site is located on the Taccu di Osini plateau, an imposing natural monument with steep limestone walls. Set in a panoramic position, it offers sweeping vistas over the Ogliastra and Barbagie districts. 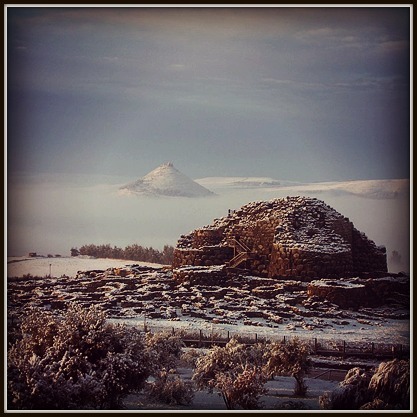 This fascinating site includes a complex nuraghe and an associated village of 8 huts, inhabited between the Early and Late Bronze Ages; there are also a cave with two entrances, probably used for food storage and two giants’ graves, one of which of the slab type, with curved front slab. On the plain of Troculu, two single-tower nuraghi, known as Sanu and Orruttu, stand at a short distance one from the other. 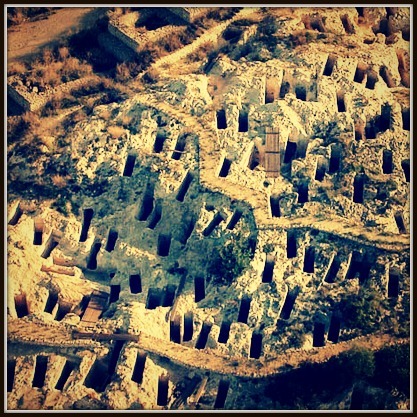 ​The necropolis of S'Acqua salida consists of eight tombs, in front of or above which there are remnants of ritual hearths and cups (small holes in the rock, destined to the offers). Some of these tombs are characterized by columns, pillars, pools, niches, shells, and traces of paint. In the wall of an internal cell of a tomb is carved and painted the symbol of the male deity: the bull, two bulls' heads "T" painted in dark ocher, enclosed in a rectangle. Two other graves have internal reliefs in imitation of the dwelling huts roofs. Another grave is equipped with a long corridor, and the input box dell'anticella painted in red ocher. The necropolis of Corongiu (nearby) consists of classic domus de Janas carved in limestone, among these there is a vertical shaft tomb antechamber, and cell with decorations in relief above and at the sides;the design has a vertical part above which there are two lateral spirals: it is assumed can represent the "goddess of the eyes" an 'appearance of the mother goddess neolithic that protected the deceased. 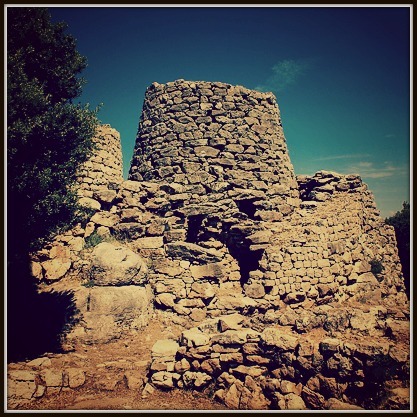 ​Santa Cristina area, near Paulilatino (OR), is one of the most beatiful Sardinian archaeological sites.The major complex includes a nuragic holy well, a nurage and nuragic habitations. Santa Cristina nuragic well, due to its mysterious appeal and inexplicable coincidences, is probably the most known holy well. 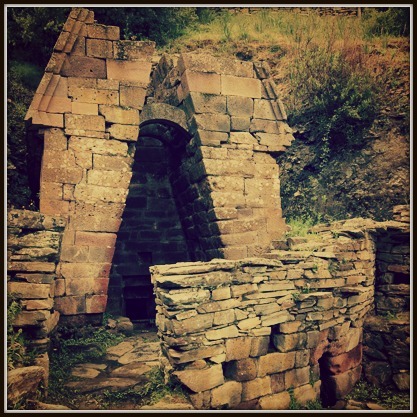 Sacred Wells had initially a circular compound wall, like Su Tempiesu holy well. Why does the moon light reflect in the well every 18 years and 6 months between December and the beginning of January? Is it only an incredible coincidence? Or did the well wall have a perpendicular opening on the top? 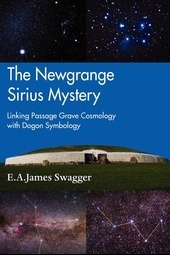 Enigmas of the nuragic culture; fascinating mysteries with no solution. Another enigma: In the past, during vernal and autumnal equinoxes, the sun shone down the steps through the hole in the stone construction over the well. 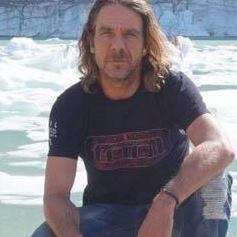 It happened when the earth's axis was tilted and Rigel Kent(even called Alfa Centauri, the closest star of the system) was visible from the island. The sun and the moon, one more together, relate to the nuragic sites. Santa Cristina refers to the little rural church near the well, surrounded by small habitations (called Muristenes o Cumbessias), used by faithful people to celebrate the saint on the second Sunday in May and the Archangel Gabriel on the forth Sunday in October . The basalt holy well constists ( as the other sardinian and nuragic holy wells) of a foyer, a descending stone staircase and an elliptical wall(tholos) wich encloses the source. The well water still runs through the extremely fine and tigh fit of the blocks during the winter and spring. The 25 steps are covered by a tholos style ceiling. The one hectare archaeological site consists of a big and circular basalt hut, the so-called “capanna delle riunioni” (the hut where meetings took place) with a big stone seat inside. One-tower nuraghe is located in the south-west part, surrounded by several well-mantained huts which date back to different periods. Nancy assists with venue booking and the various daily operations of MKT. Nancy holds an Honors degree from York University. It was her thesis, where she argued that the field of psychiatry’s sole purpose was (and still is) to benefit the drug companies that sparked her true desire for the Truth. 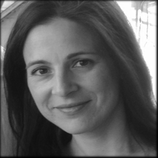 Nancy is currently an elementary school teacher in Canada. Her goal is to empower children at a young age to respect and love their earth, to be empathetic, to become global thinkers and to ultimately realize that we as humans are all connected. Her interest in environmental issues and sustainability has resonated with her students as she led them in creating an ‘eco-certified’ school. She is currently developing a program for girls aged 10-13 to guide them in becoming critical thinkers and become aware of how media and marketing specifically influences their lives and choices. Nancy's pleasant and friendly personality is both engaging and insightful, helping out with all your needs on the tour and to bring a delightful perspective to your experience in Ireland. Masters degree in Engineering, Bachelor’s degree in Physics with Astronomy, Masters degree in Research, Science, and Society. - International/Domestic Flights to and from London. We know how important an internet connection is for many of our guests! We will do our best to arrange accommodation with complimentary Wi-Fi, however we can’t guarantee this, we also can’t guarantee the reliability or speed of any free or paid service provided. ﻿All travelers need to ensure they have a valid passport with at least six months before expiry after the date of entering the country. A non-refundable deposit of $640.00USD per person will be required at the time of booking, Final payment will be due on SEPTEMBER 1ST, 2016 (we will remind you). It is the responsibility of the traveler (or agent) to determine that final payment reaches us. Bookings made within 45 days of departure date will require full and final payment upon booking. No booking will be considered until final payment is received. We ask that payments are made via Bank Transfer. Any bank fees charged will be the responsibility of the sender. Please inquire about this before you make your bank transaction. Due to high preparation costs, cancellations must be received in writing as soon as possible. Cancellations received 45 days prior to departure will have a penalty of $640.00USD; those received between 30 and 14 days prior to departure will have a penalty of 50% per person (of the total amount of the tour). Cancellations received 14 days or less before departure will receive no refund. Note* depending on the circumstances of the cancellation we may be willing to transfer your trip to another person, please have in mind this could incur extra costs. No refund will be made for services voluntarily not taken or participated in during the tour. October sees an average temperature of 18°C, which some may find welcome following the high temperatures of the previous months, with a high of 22°C, and a low of around 13°C, leading to much better sleeping conditions of an evening. Money and Banks: As with most of the European Union, Sardinia uses the Euro. There are places to exchange money at any airport and money can also be exchanged in most banks. A person wanting to exchange one currency for another will have to show a valid passport or identification card. There are banks all over the island where money can be withdrawn from automated teller machines, and most of the machines accept credit cards or bank cards with a personal identification number. Emergencies: There is an emergency response system in Sardinia, and emergency calls can be made from any public or private phone. Sardinia has police, military, ambulance, fire and coast guard emergency responders. Post Office: Post offices are located all over Sardinia where stamps can be purchased and letters can be mailed. Most post offices open at 8:20 a.m. and they close at various times depending on their location. If you have any health concerns about joining the trip please contact us. We will also be on hand during the trip, please speak to Modern Knowledge if you have any concerns, we will do our best to help! We often receive inquiries about the suitability of our tours for mature people and the fitness levels required to attend. We have a wide spread of ages joining us, quite often from 20 -70 years old. In almost all cases we will have our transport close to hand for anyone that would like to take a rest, please have in mind there will be a good amount of walking involved, generally the walking will be on flat ground, however in some cases there will be up hill hikes. We may need to changes the sequence of site visits in order to adapt to conditions on the ground, as well as the groups requirements, alterations in other unforeseen circumstances may also impact the tour schedule. The tour schedule will remain the same, barring any unanticipated complications. We ask that all participants obtain Travel Insurance. This will protect you against, trip cancellation & interruption, and pays for loss due to unforeseen circumstance, death, injury, or illness to you or a member of your family. It also includes coverage for missed connections due to weather, pays for lost deposits due to the financial default of the airline, the tour operator. It also covers you against lost baggage and delays, travel delays, medical expenses and emergency assistance. By signing up to the tour you agree to Modern Knowledge Tour Operator's, deposit conditions and waiver. Modern Knowledge it’s agents and tour Facilitators have worked hard to ensure all of the arrangements for the above tour will run smoothly, however, Modern Knowledge it’s agents and tour facilitators will not be held liable for delays, theft, damage, injury, or any other irregularities that may occur during the course of the journey. We will not be held liable for any changes or delays in airline schedules or missed connections; injury, loss, or damage to persons or property; additional expenses resulting from changes in exchange rates, tariffs, or itinerary; any transportation issues or problems with vehicles utilized on the tour; additional expenses incurred due to illness, weather conditions, protests, war, terrorism, quarantine, or other causes; and losses due to cancellations not subject to our terms and conditions.